Sorry, the HMC5883L went EOL. This part is retired but we recommend the MAG3110 magnetometer or the 9DoF Stick which has a magnetometer built in. Neither are drop in replacements but both will allow you to detect the earth’s magentic field. Unfortunately, this sensor has one I2C address. To reduce the number of RedBoards, you might be able to use the SoftwareI2C [ http://playground.arduino.cc/Main/SoftwareI2CLibrary ] to address each sensor on different pins of the Arduino. You can also use the PCA9546A IC [ http://www.ti.com/product/PCA9546A ] to switch between four I2C channels. 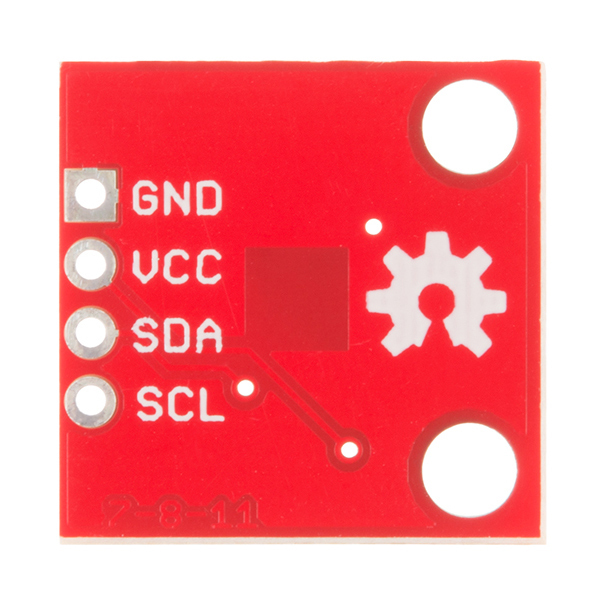 This chip is ideal when you have a sensor that has only one I2C address. Unfortunately, we do not have the IC available yet on our storefront. I had recommended it to our catalog but I haven't heard back. There is interest but I haven't heard back from our catalog on the details. You would also need to design a breakout board for that chip. There's another good tutorial with example code by Love Electronics on their site => http://www.loveelectronics.co.uk/Tutorials/8/hmc5883l-tutorial-and-arduino-library. Try looking at this tutorial that was written by someone in the community => https://github.com/Razor-AHRS/razor-9dof-ahrs/wiki/Tutorial#sensor-calibration . It goes over how to calibrate the magnetometer that was used on our retired 9DoF IMU [ https://www.sparkfun.com/products/retired/10736 ]. It also talks about what can affect the magnetometer readings when there are soft and hard irons in the vicinity. Unfortunately, our older example code from this tutorial [ https://www.sparkfun.com/tutorials/301 ] is not compatible with certain versions of the Arduino IDE. It only works with Arduino 0023 or below. Arduino 1.0+ wonât compile with it because the libraries changed. Try using the bildr example code. Otherwise, you would have to rewrite the code a little to communicate with the sensor. Testing with two Neodymium round magnets (with a diameter = 10mm ), the magnetometer can affect the HMC5883L on the Razor around ~22inches (~0.6 meters ) away. The closer the Neodymium magnet is to the sensor, the higher the value was when viewing the magnetometer's raw output. Very useful, thank you. Does it measure the static magnetic field or oscillating magnetic field? Which range of frequency measure? ELF, VLF, ULF, ...? Very useful, thank you. Does it measure static magnetic field or oscillating magnetic field? Which range of frequency measure? ELF, VLF, ULF, ...? I'm shocked !! Honeywell announced End of Life for this sensor and the 5983!!! They have no replacement as far as I know.. especially regarding the 220Hz bandwidth of the 5983. I just found an app note from Honeywell which states that pin 5 should be connected to VDDIO rather than the no-connect listed in the data sheet. They say it will affect I2C performance in a small percentage of parts if left unconnected. I'm having some I2C hiccups on mine, so I'm going to try adding a jumper. Not tilt compensated yet, but they say they will do a tilt compensated tutorial soon. you can apply is 3.3Volts??? Does this mean you need to use 3V3 logic? Or can i connect it to 5Volt logic??? In the tutorial they power it off 3.3V, and the pull ups are also to 3.3V, so it the chip is receiving about 3.42 - 3.5V on the SDA and SCL lines, I think that should be okay. So i can plug it directly to arduino without disabling the internal pullups that wire enable by default? Use a simple voltage divider network on the outputs from your Arduino to the module. AVRs are tolerant of 3.3v inputs, so you should be fine there. If you have a strong magnet can you use this as a linearized magnetometer to measure distance ? Thanks. Is it possible to change the address to use multiple HMC5883L on the same interface? No, unfortunately not. If you wanted to use multiple devices, you would have to have them on separate I2C buses. Received a few days ago one of these breakout: imagine my dismay when I found out the interrupt pin (DRDY) is not connected! Seriously? Could we get the drdy pin broken out. I need it for the project i'm making. Can this be used on a pipe that has flowing water through it, or would that mess with the readings? While trying to get sane heading readings I found out that the sensors need to be calibrated or else their output will yield very non-linear readings. Here is the process/software I found: http://diydrones.com/profiles/blogs/advanced-hard-and-soft-iron-magnetometer-calibration-for-dummies. Basically, you map the extremes in all orientations and the software creates values to "center" your readings. It makes perfect sense when you open MagViewer and see the scatter plot of the data! Those values would vary tremendously based on your geographical location, and your location relative to lots of stuff around you. Inside of a building vs outside, near powered train tracks, near overhead power lines, etc. If you want to get an idea of what the magnetic field should look like around you, you need to use the International Geomagnetic Reference Field brought to you by the hard-working folks at NASA and NOAA. So what about putting it on a pipe with flowing water? 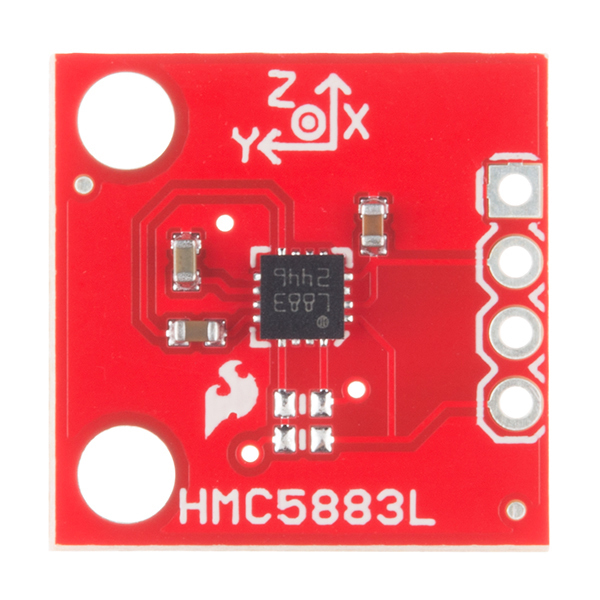 Any plans for an HMC5983 breakout? The 250hz update rate would be nice! It is mostly the same pinout but don't forget to run pin 6 to a solder pad so we can select SPI/I2C. 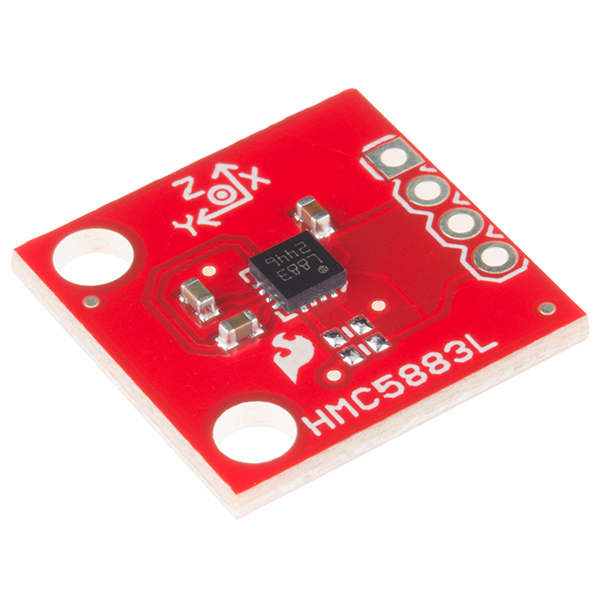 Also check out the MLX90333 hall effect sensor. It does all the math internally tio implement a hall effect joystick. While researching setup info prior to installing the Sparkfun unit I was surprised to find very little info specific to using it as an external on an APM 2.5. I had assumed that it was common practice to use this board as a 3DR mag substitute and that it would be nearly identical to the 3DR board when it comes to it's setup & use. Will there be any code loading Or additional programming necessary with the SF Mag / APM 2.5 setup that is not necessary when installing the 3DR External Magnetometer?? Anyone aware of feedback from others using the SparkFun Mag as an external on their APM 2.5 & If so, how is the SparkFun board working for them? I'm assuming that I'm just over-thinking this & the setup will actually be the same or even more straight forward than with the 3DR, but I just want to check first. I am also curious if you got this working.. I think I have a bad compass in my 2.6 APM and was going to go buy one of these at a local SparkFun retailer tomorrow... Very curious if you've been successfully flying with this breakout..
433011, did you get this working? I'm interested in doing the same thing in my Bixler, where I have my APM 2.5 mounted too near some power wiring. I have an Arduino Nano V3 that is already connected to other I2C ICs that expect 5V, and the I2C lines are pulled up by external resistors. Everything is working fine. I understand that the 3.3V needs to power this chip, but what about the I2C lines? Will they work in tandem to the other I2C devices? If you have devices that are powered at different levels, you should use a level-changing circuit in your I2C lines. Sparkfun sells one but you can also build one easily with 2 transistors. Look for I2C logic level shifting like this application note pdf. I'm getting the previously mentioned y-axis no worky. The x and z change with rotation but the y stays around -200 when the compass is rotated like a record player. Anyone figure this one out? Using this chip breakout board on the Arduino Uno with the example provided I was getting an error at 180 degrees when raw X is less than zero and raw Y is equal to zero. Adding the following "if" statement to the //convert to heading section fixes things. Do you have pull-up resistors on both the clock and data lines? There are solder pads on the PCB to add resistors but the resistors aren't included since many uCs already have pull-up resistors on the I2C bus. Add a 10K pull-up to 3.3V on both lines and it should work. This board/chip is a real disappointing. The data I get from this chip when parallel to the ground is not right. It reads out the Y axis in the Z axis. And each axis has its own scale. Z axis reads from 0 to 512 and X reads from -123 to 173 and the Y axis stays within 280 to 290 when I rotate it around the Z axis. The whole thing is bogus and unreliable. I am going to return it to where I bought it and get another brand. Also the board shows on the schematic that is has the pull up resisters (2.2K) on the SDA and SCL lines. But look at the pictures on the board they are missing! They say nothing about it. The resistors should be right above the 58 markings on the board. Very disappointing! See my reply to Member #400477 about the resistors. You need to use an arc tangent function with the x and y data to get a heading. Many libraries have an Atan2 function that take two arguments and returns an angle between 0 and 2*pi. I'm stuck on the same problem, the scales and its X Y axis confused me a lot. I still couldn't figure out what the three dimensions for. About pullup resisters, look at the schemetic on module's datasheet. That's more accurate. 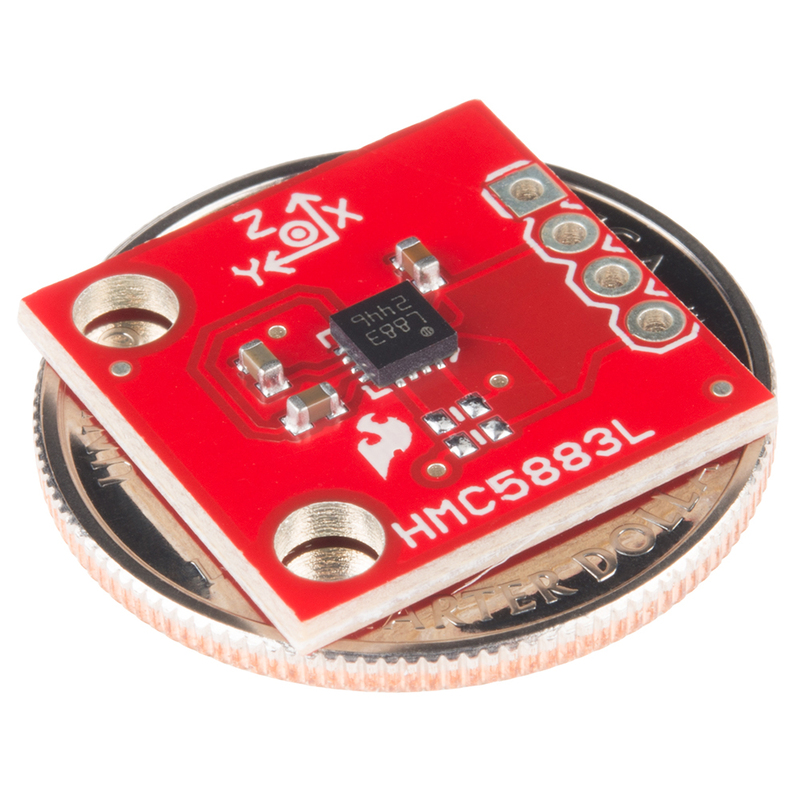 I've never been able to get any useful measurements from this sensor, is there an alternative i2c compass sensor? Received this yesterday 9/21/2012 and connected according to the Bildr Tutorial, used the example code posted on this page, and everything seems to be working. Raw values on each axis between -4096 and +4096. However, the data sheet and everything else I have read indicates that EXTERNAL pullups are required and the schematic above shows the pullups but the pads on the board are not populated. What am I missing? Why does it work without them? It works because the Arduino Wire library turns on the ATmega's internal weak pull-up resistors by default. This situation will work but isn't ideal; you should really have external pull-up resistors to 3.3V. In the future you'll probably need to use pastebin or some other text sharing site to keep this formatted well (or heck use GitHub! <--- best answer) and then link to that. What is the resistor size (not value) for the pull ups? 2.2kOhm according to the datasheet. I just got HMC5883L and tried to run the example code. However, I only get the same number. I haven't look up the example code, but I think it's probably because the module's default mode is single measurement in mode register. Wire.send() has been renamed Wire.write(). .. As of Arduino 1.0, the Wire.receive() function was renamed to Wire.read() for consistency with other libraries. Can anyone explain for me where I am and how may I proceed from here? If you change "receive" to "read" in each of the cases that you see an error, your code should compile again just fine. has anyone tried this magnetometer with PSOC?, i am having some troubles with the 3 axes signals. I have been trying to get a reading using an Arduino UNO, but no matter what code I use, even the above example code, the reading output never changes. Could it be the code or the chip? I have tried multiple other codes and they all do the same thing. is there a version of this example code in Arduino 1.0? Never mind, I just replaced all the 'Wire.send' and 'Wire.receive' with the new Wire.h commands. Also is it common to have to add the byte() command when sending a 0x00 via Wire.write()? I find it kinda' odd when 0x02 works in the line above it in the example code. Must be some type value translation issue I would guess. Why 3 dimensions? I understand x,y for N/S and E/W, but how would you use the z axis, especially if it's not tilt compensated? The local magnetic field isn't just north-south; it also has an inclination or tilt that changes with your location. You can imagine that near the equator the field lines will be roughly horizontal, but as you near the magnetic poles they will tilt higher and higher. If the sensor is held horizontal, the X and Y axes by themselves can be used to determine magnetic north. But if the sensor is tilted at all (and you know the tilt, by using a separate accelerometer), you can use the third axis to compensate for the tilt. In the example; is the data printed as degrees, radians or Gauss? Can I put 4 of these devices in the same TWI bus? I read over the datasheet but I am not sure if the their inherent addresses can be changed. This chip does not have address-altering pins like some I2C devices, so you're stuck with the factory address. Sometimes you can get around this by running additional lines to the chip's reset inputs, enabling only the one you want to talk to, but unfortunately, this board does not break out the reset line (sorry). I'm working on a circuit that will have four of these, interfaced through a PCA9546A I2C mux. I have no idea if it will work, though; these chips generate magnetic pulses to re-magnetize themselves every time they take a measurement; I could see them throwing off each-other's calibration. I will try anyway. That is a bummer. Thanks anyhow. If you're feeling ambitious, you might be able to access the reset line from the top of C2, but we haven't tried this ourselves. Just a heads up - the pin assignments are the exact opposite of the retired HMC5843 (or at least the ground is). I almost bought it for an existing board...good thing I noticed. Has anyone had any capacitor problems like with the early HMC5843 boards? Did Sparkfun do anything special with the caps on these ones, or are they ordinary garden-variety caps? I too am very curious what capacitors are used. I can't for the life of me find a 4.7 uF SMD ceramic cap that meets the spec sheet's recommended < 200 mohm ESR. Is this from a new manufacturer? Or has the old manufacturer started requiring fiducial markers? Or has that always been a requirement and I just never noticed before? Hi Matt - we are the manufacturer (swing by Boulder some time and you can see us build over 300 different designs). We use fiducials so that the pick and place machines can visually measure the skew on any given PCB. Every PCB is unique and has a few microns or millimeters of adjustment. I think they look ugly but the pick and place guys swear by them so you'll see them on almost every board we design. 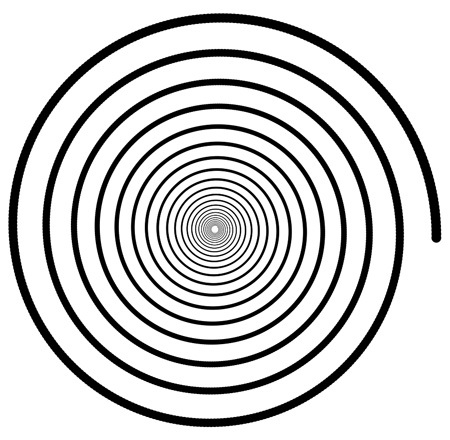 I've seen people do "fiducial art" (Spirals, suns, etc) on their boards to mask their ugly appearance. I wonder if you could make Sparkfun-shaped fiducials. Could we get an Arduino library or possibly some code? Check the example code above, I replaced it with a PDE sketch. When using the Arduino code above, what would the northern end of a magnetic field be on the z axis? It might be best for you to search around in the forums for how magnetometers work. This will do what you want, but you may need to couple it with an accelerometer for tilt-compensation, unless you can get it level enough. But what value is the northern end? zero? For sure you can tell me that. Considering this is a $1.5 chip in volume, and those caps are probably 1/20th of a cent I'm pretty flawed by the price. This doesn't even follow the app notes properly which specify there should not be any traces or ground planes under the chip. There are no traces or ground planes underneath the chip. The Eagle files confirm this. Do a ratsnest on the BRD file, you'll see that the Eagle file does put a ground plane under the chip, but I doubt this will cause any significant problems. Slowly over time, capacitance from the ground plane could cause problems with the internal clock, but I kind of doubt it. In the same way with a micro controller you shouldn't have a ground plane under the oscillator, you can still sometimes get away with it if your timing requirements are not that precise. In short, yeah, there is no reason for it to be there, but I don't think it's hurting anyone. As of the one I got Nov 2012 there is no ground plane under the chip. I am considering this board because I could scrape off the copper under the sensor with a knife or flat screw driver. Also, looks like the trace form VCC misses, but this was probably luck and not careful adherence to datasheet recommendations. My mistake. I wasn't considering the bottom layer as a potential source of magnetic noise. possible source of magnetic noise. For best results, use non-ferrous materials for all exposed copper coding." Wow, why the high price? Oops. The system carried over the price from the 5843. Price has been updated. That was our mistake. It's fixed now. Works with the sketch sparkfun uses as an example, was able to create a 500 lb propane tank level indicator (propane tanks have a magnetic coupled gauge). saves making a little board myself, just to try out the chip. Board is good - for me wish it was a little smaller. .. and fast. I would give it five stars, but it could use a non-Arduino code example. This item is very usefull for my projects. I hope shopping very soon. See you!! !